Yesterday was my first day of graduate school. I raced from the preschool drop off to the school's parking garage. From door to door, it only took me a half hour. I sat outside for a bit, waiting for the course to begin. I was nervous as anything. Everyone was pretty young. Does no one go back to school for their degree any more? I'd brought my laptop just in case. Who knows how people take notes these days. Just the other day, a teacher friend of mine posted a picture of kids taking pictures of the white screen. Wow, really? I just want to lay this out. - Napster was a thing. - Comic Sans was acceptable. - We used printers at the library. - Assignments were due at the next class...because physically carrying a paper to a professor was the only way to hand it in. - We used 35mm cameras. - I had one teacher with a Palm Pilot. And she was so proud of it, she mentioned her Palm Pilot four to five times a class. - Having Toad the Wet Sprocket play automatically as your crappy webpage you made with the first edition of Dreamweaver or Pagemaker ever was the height of sophistication. - We had to pay for delivery of the New York Times to our dorm rooms for journalism classes. - We had to buy our books at the campus bookstore. Other options didn't exist or were very difficult. - Libraries used physical card catalogs. - Lexus Nexus was the best thing ever. - Learning to use microfiche was very important. - Color coding sections of text in your word document (or Word Perfect, remember that?) was as complicated as note organization programs got. - TI-82 calculators. That is all. - Professors used laminates, white boards and chalk boards. - Mechanical pencils were cool. - Slides. Grainy, awful photos, blown up too much, one after another after another. Click. I mean, nowadays, did people even use notebooks and pens anymore? Would everyone whip out their tablet and go to town? Any advice on this new fangled going-to-school thing is welcome. 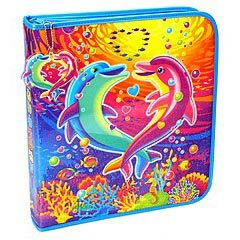 Just don't tell me to get rid of my Trapper Keeper. You will have to pry the hot pink snow leopards on the moon from my cold, dead hands. mechanical pencils will always be cool!